On 16 Baishakh, 2075 [29 April, 2018], TU has published form fill up notice of M.Sc. Math Make Up Exam for 2072 Group. Check and Download All Question Papers Of BACHELOR LEVEL/(ONE YEAR)/EDUCATION 2074 - 2018, Tribhuvan University. Today 25 April, 2018 [12 Baishakh, 2075], CTEVT publishes the exam routine for DIPLOMA & PCL Scholarship Program 2075. 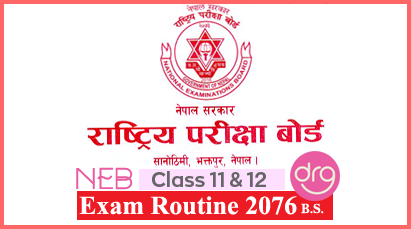 Notice from NEB | How To Check Class 11 & 12 Students Exam Memo? Today, 25 April, 2018 [12 Baishakh, 2075], NEB published a notice regarding the Student's Exam Memo for Class 12 and class 11. Secondary Education Examination (SEE) Supplementary Exam Papers (Question Papers) 2073/2017. Tribhuvan University Office of Controller of Examination, Balkhu publishes the Exam Centers for 1st Year MA, MBS, M.Ed and MPA. Are you facing trouble while uploading Zip File on your blogger post and make it available on your blog for the readers to DOWNLOAD?